Giovanni Levanti was born in Palermo where he graduated in Architecture. As he was interested in the artistic avant-garde movements and radical design he moved to Milan. Here he attended Domus Academy and started his collaboration with Andrea Branzi. In 1991 he opened his own studio. His work was immediately recognised and appreciated: he took part in the exhibition “12 New Memphis” and renowned design brands such as Cassina, Edra e Campeggi began including his projects in their own catalogues. He has always been exploring – through a method based on the constant feedback between intuition and discipline – different possibilities and new typologies for renewing the domestic comfort: “ a brave protester of the living room” for Beppe Finessi, “an individualist method and an individual work” for Alessandro Mendini, “one of the most original Italian designers” for Vanni Pasca. His work is placed between vision and reality, utopic openness and production. He has worked, among others, for Alessi-Twergi, Azzurra Ceramica, Diamantini&Domeniconi, Foscarini, Pallucco, Salviati, Serafino Zani and for Japanese companies such as In the Room, Marutomi and Nagano. His objects are part of the Permanent Collection of Italian Design at Triennale in Milan, Design Collection at the Museum of Fine Arts in Montreal and Design Collection at the National Museum of Modern Arts of the Pompidou Centre in Paris. Throughout the years his works have been selected for prestigious international exhibitions among which the most recent ones are: La bellezza quotidiana. Un percorso nella collezione Permanente del Design Italiano, curated by S. Annichiarico (Monza, 2014); La casa morbida, by B. Finessi (Milan, 2014); Ultrabody, by B. Finessi (Milan, 2012); Design una storia italiana, by M. Romanelli (Rome, 2011; Turin, 2012); Le Fabbriche dei sogni, by A. Alessi (Milan, 2011); Quali cose siamo, by A. Mendini (Milan, 2010); 1978-2008 Made in Italy, Brazilian Design Biennal, by V. Pasca (Brasilia, 2008); Il modo italiano, by G. Bosoni (Montreal, 2007; Toronto, Rovereto); 1945-2000, Il Design in Italia,100 oggetti, by S. Annichiarico (Seoul, 2001 travelling); Italia e Giappone – design come stile di vita, by A.
Palermo Design Week Prize (Palermo, 2007) and Design Plus Prize (Frankfurt, 2000); Selection for the XXII Premios de Disegno cDIM Professionales (Valencia, 2004) and for the XIX Premio Compasso d’Oro ADI (Milan, 2001). In 2014, a solo exhibition “Il Candore Umano” was held at Palazzo Agliardi within DimoreDesign in Bergamo. In 2010, a broad retrospective of his work was curated by Beppe Finessi, in the grounds of the Careof and Viafarini Galleries, at the Fabbrica del Vapore in Milan. In 2007, his first solo exhibition was held at Literary Café of Teatro Massimo in Palermo. 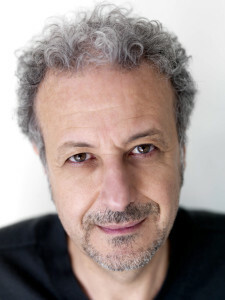 Along with his professional activity he has also been teaching: as visiting professor at Scuola di Specializzazione in Industrial Design of the Faculty of Architecture in Palermo; master and project leader at Domus Academy in Milan; professor at NABA (Nuova Accademia delle Belle Arti) in Milan. He teaches Industrial Design at ISIA (Istituto Superiore delle Industrie Artistiche) in Faenza and at the Academy of Fine Arts in Catania.